The Woodlawn Methodist Episcopal Church was organised in 1859, first known as Fagan's Chapel. On 21 January 1859, T.B. Pruett deeded to the trustees of Fagan Union Church or the Methodist Episcopal Church, South, for $1.00, a one-acre lot in District 8. The lot's boundaries were Wood's Lawn (from which Woodlawn got its name), and the Clarksville-Dover Road. The deed stated that the title was to the trustees and their successors as long as it was used as a Methodist Church; that if the time should ever come when it was not, said land would revert back to Pruett or his heirs with the improvements thereon. The deed was notarised in 1872 and recorded on 2 May 1873. The first church building was a small crude structure, constructed of logs. It was not ceiled for many years. It was used for a subscription school during the week for approximately three months of the year, while on Sunday it served as a church. Subscription schools were funded by a monthly tuition fee paid by the parents to the teachers. In turn, the teachers were responsible for securing a place of study and for paying the rent from their earnings. Because of the low pay, many teachers were women, and they typically received one dollar per pupil per month. Attendance usually lasted a few months, because children were needed to help with harvesting and other farm chores. The membership increased and the church thrived until the War Between the States in 1861-1865. The question of slavery brought about great trouble and division in all the churches. After Emancipation and reconstruction there was a gradual uplift in all the churches in the vicinity. Early in 1868 a new frame building was erected for the church and the log building retained for the school. In 1887 Finis Ewing deeded 10 acres to the trustees of the church. In 1897 the frame building was razed and the present building was erected. Originally, what is now the back of the church was the front, which faced the old Dover road. When Highway 79 was constructed, for many years the rear of the church faced the highway. In 1941 the establishment of Camp Campbell, later to become Fort Campbell, made a drastic change in the community of Woodlawn. Two of its sister churches, Asbury and Stamper's Chapel, were taken in by the camp and disbanded. Many homes were within the reservation area and families were forced to relocate elsewhere. 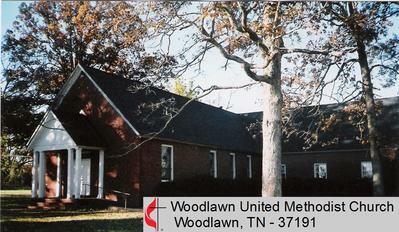 Some individuals from these churches made Woodlawn their church. After World War II ended, the congregation enlarged, and in 1950 Sunday school rooms were added to what was the front of the church. Then the front was changed to what was the rear of the church. A concrete porch and a new entrance with double doors were built, facing the new highway. The pulpit was moved to the opposite end of the building and benches were turned around. One of the original two front doors was walled in, and the other serves as the entrance to the present fellowship hall. A few years later, brick siding was added to the building, and the old Sunday school rooms were replaced with the present fellowship hall. James Norfleet and John Byrd gave of their time to build the first church. The Rev. Stephen Mallory was one of the first pastors. Bruce Caroland a carpenter and the father of Alden Caroland, built the present auditorium.